So Republicans are waxing enthusiastically about their new mid-term election meme - - the mob...fake, paid protesters!! - - which is actually just a variation on their decades-old Red Scare/outside-agitators propaganda - - and will pay no attention to fact-checking that shows there's nothing to the allegation. I hope this ugly GOP variant sends more women to the polls to vote against Trump and his allies for adding to their mocking degradation of Dr. Christine Blasey Ford this fresh, smug dismissiveness for having come forward in the #MeToo movement. By the way, when Trump talks about 'the mob,' does he mean The Russian Mob or the guys who are said to hang around New York City construction sites or Atlantic City casinos? And I also recall that it was our incumbent Governor seemed to know something about planting protesters in a crowd. Murphy: Well, we’ll back you any way we can. But, uh, what we were thinking about the crowds was, uh, was planting some troublemakers. 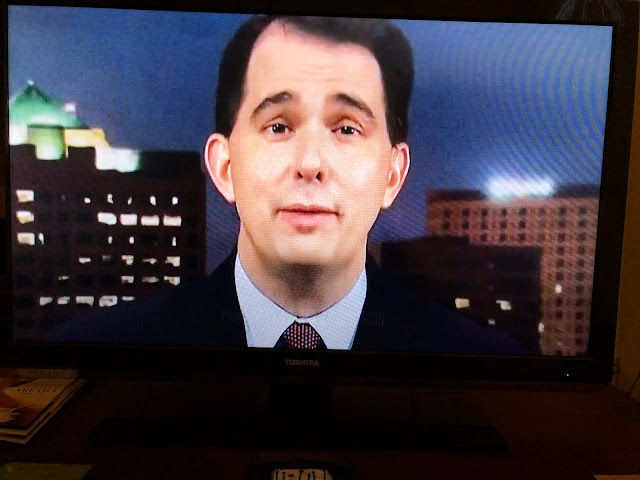 Walker: You know, the, well, the only problem with that — because we thought about that.... My only fear would be is if there was a ruckus caused is that that would scare the public into thinking maybe the governor has gotta settle to avoid all these problems. In other words, Walker could foresee only political problems with such a move, but nothing negative from an ethical or legal perspective. We have only Walker's words suggesting that he didn't approve the plan. Who knows, and by the way, we never found out who was included in "we thought about that..."
This should have been the end of Scott Walker's political career, but the state's media echo-chamber published any reports on this based-on the his talking point: That it was unfair to judge Scott Walker on what he actually said and admitted to because it was released during a prank call. The context of why Scott Walker so foolishly shot his mouth-off as a bigshot does not matter -- Scott Walker revealed just how little respect he has toward the citizens of Wisconsin that he has a sworn duty to serve. On the national stage, even right-wing media cannot make Scott Walker look like a legitimate presidential contender. But across Wisconsin, he has been propped up with propaganda ever since he mastered dog-whistle racist rhetoric inflaming outrage and hate against the city of Milwaukee. When Scott Walker abused Milwaukee County taxpayers by campaigning across the state riding a Harley Davidson, in-state media fawned over him. When he tried to make this the basis of his failed presidential campaign, "I have a wife, 2 kids, and a Harley", national media exposed him for the fool that he is. I am glad you brought this up again, because Walker's BFF MJS and the rest of the state's media circus flushed this criminal act down the memory hole a long time ago. This candid admission should have landed Scott Walker in prison. It should disqualify him from any elected office, but law enforcement authorities failed us and the state's media is complicit with normalizing these kinds of crimes. I share because some became giddy about earlier polls that showed Evers with a lead and some have even go so far as to proclaim Walker is being widely rejected. This was clearly not true despite how anyone may want to spin poll numbers. Defeating Walker is going to take historic turnout for a mid-term election. Just like in 2016, if people stay home, Walker is going to win. Given what has happened in Wisconsin election in the past, Marquette Law Poll showing a dead-heat means the official results are going to favor Walker. Remember, this organization now has a track record and we are seeing the same pattern we saw in previous Walker races and in 2016. The polls move towards "too close to call" as election day approaches. The recorded vote, just like the recall, 2014, and 2016, tells a very different story. I appreciate that The Political Environment has been showing more restraint as polls are released. Change means voting for Evers to put the brakes on what will be another massive assault on workers should Walker prevail. Only be displacing Walker can we work together to begin reversing the GOP multinational corporate agenda. It is not going to happen over night and it is not going to happen if anyone sits this one out because their primary candidate did not win the nominee. MADISON, Wis. — One Wisconsin Now Executive Director Scot Ross released the following statements on the latest anonymously-funded Marquette University poll. *This does not apply to Leah Vukmir, who apparently no one likes. My comment: Franklin knows exactly what he is doing by oversampling republicans. It is not happenstance, just like the earlier polls in other races move this way leading to election day. This is a tell. Mark my words: The fix is in, but don't expect pundits and any media outlet in Wisconsin to critically look at the numbers. Our elections are proprietary, non-transparent, and entirely unverifiable. This is also not due to happenstance. Does anyone else remember the Command Central voting shenanigans in the recall? Folks, marquette law poll wants you to believe that 10% of Tammy Baldwin's supporters are going to vote for Scott Walker. This is a a massive lie and proves anon above is right - the fix is in and mlp knows it. The fix is not in, but the Bradleys (Who own MU Law) are trying to give the impression the race is still a toss up vs Lean Evers. Its a psy-op. Franklin knows his result is BS, but he is also showing the way out. If more Dems get angry and vote, Evers wins by a solid margin. Back to the topic- GOPs realize Dems have the energy and are on the right side of the issues, and GOPs cannot win on their positions. Which is why we're seeing the same lies being recycled about "dangerous mobs" and "paid protesters." Everyone is welcome to their opinion -- we all know that election systems were hacked in 2016. No one can say if vote totals were directly or indirectly impacted, but even simply tampering with registered voting rolls could swing a close election. MLP, which is funded by anonymous donors and this is why Franklin moved it from a public institution where it would be subject to open-records requests, plays this same game every cycle. If anyone thinks they are taking a chance on being exposed with a race that they are intentionally misrepresenting in the hope that it swings there way, they are fooling themselves. The pattern of moving the race to tie or GOP lead is a tell -- the election system is not secure. I attended the recent Wisconsin Elections Commission. They refuse to address the issues of proprietary voting systems that no one can objectively verify. There are concerns that the election voter databases are being purged -- they acknowledged that a recent mailing used to purge voters was flawed. Do what you like -- but this commenter is urging people to accept that the elections are not tamper-proof, there is legitimate and widely accepted reason to question Trump's wins in WI, PA, and MI; and if there were shenanigans then, we likely saw shenanigans in 2012 & 2014. There is reason to suspect the fix was in for Romney in 2012 too and this is why Karl Rove had a temper-tantrum on election night. In 2016, we learned that proclaiming elections were in the bag for Democratic Candidates meant nothing when the official tallies of recorded votes we published. I am glad we agree that MLP is not nonpartisan and may not even be legitimate. People that think all this money and statistical foolishness is being done willy-nilly are playing into their hands. We've seen this same playbook over-and-over again and many acknowledge 2016 results are not legit -- why assume it is different now?